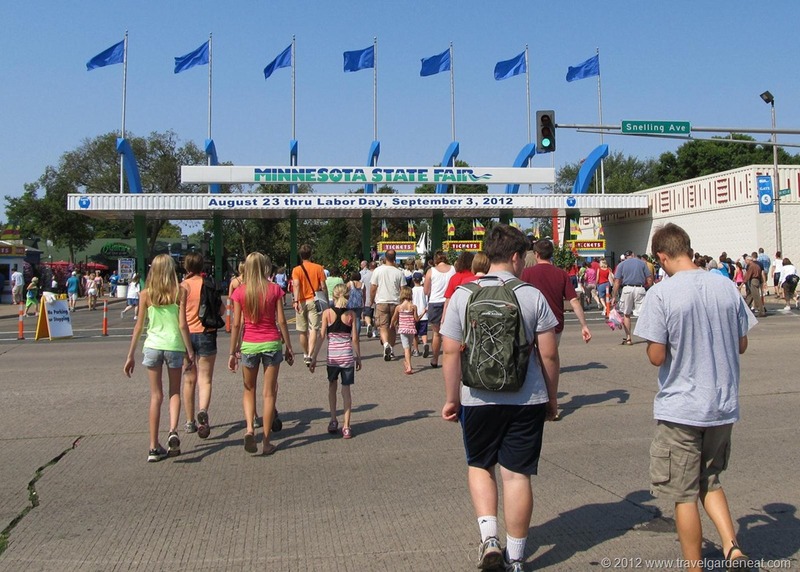 One in 164,694 (People): A Day at the Minnesota State Fair – Travel. Garden. Eat. 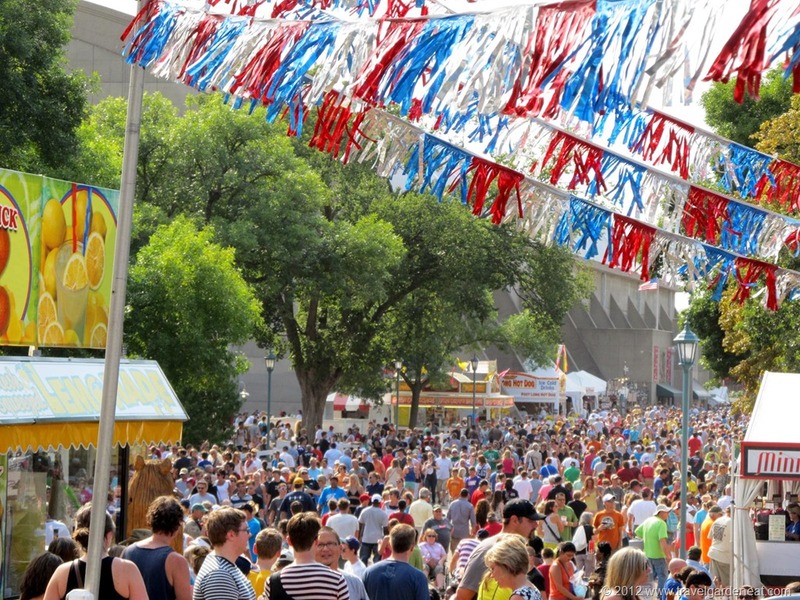 The Minnesota State Fair is called “The Great Minnesota Get-Together” for good reason. All walks of life come together in St. Paul during the two weeks leading up to Labor Day — Minnesota’s last summer hurrah. 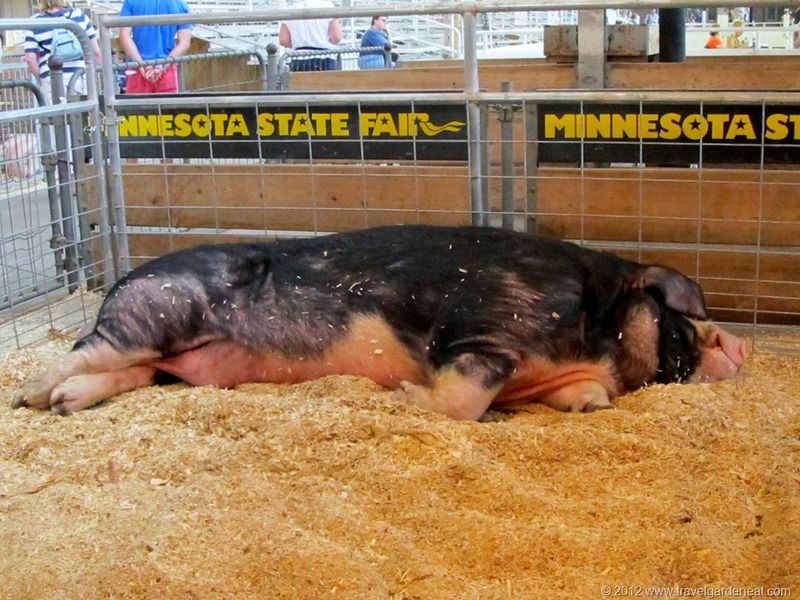 It seems that Minnesotans either hate or love the Minnesota State Fair. My husband falls in the former camp and I in the latter. Thankfully, my boys have adopted my point of view, and we gladly deal with the crowds in order to enjoy our annual pilgrimage to this great tradition. 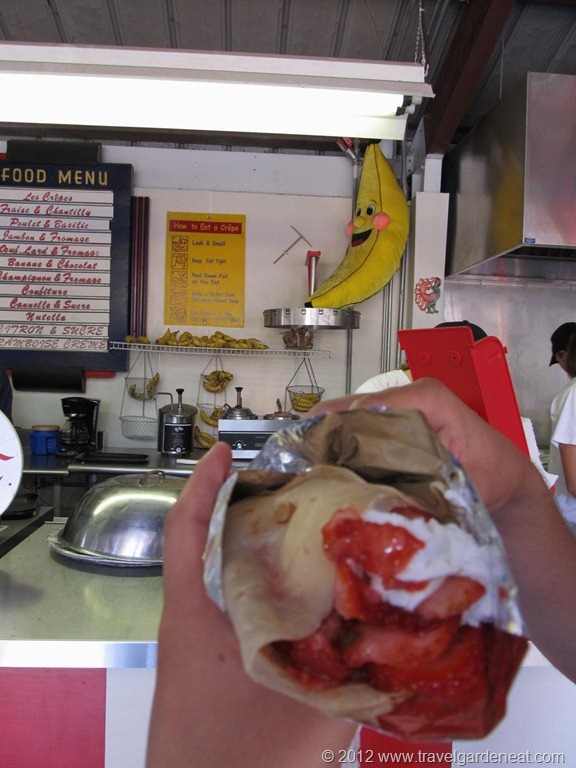 Planning our annual trek to the Fair requires careful research into the newest foods, attractions and exhibits. 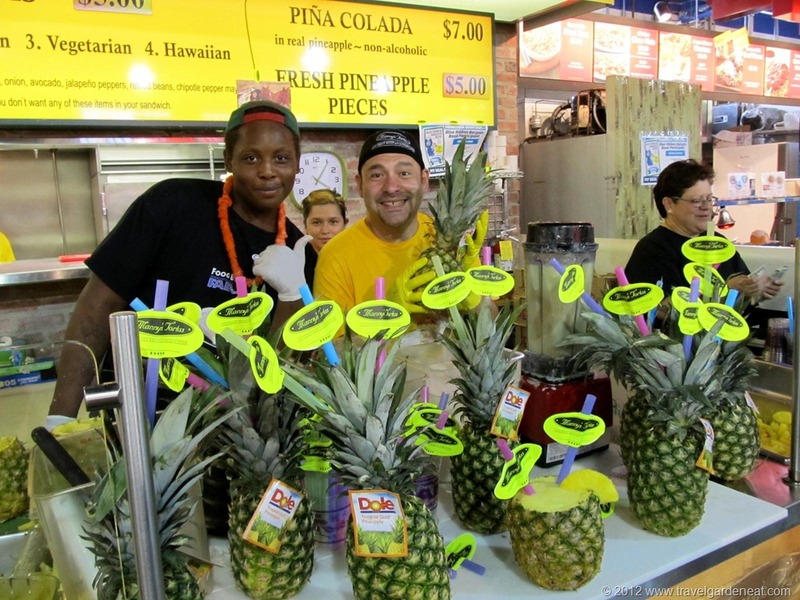 We have our Fair food favorites, many of which we share to maximize the diversity of our unhealthy diet throughout the day, but we also enjoy trying at least one new food every year, too. 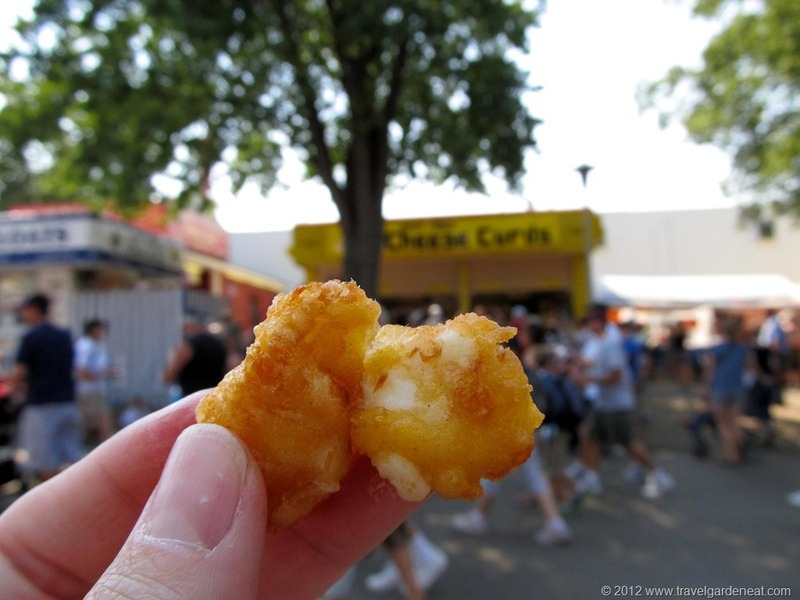 Personally, I cannot leave the Fair without at least one order of cheese curds. 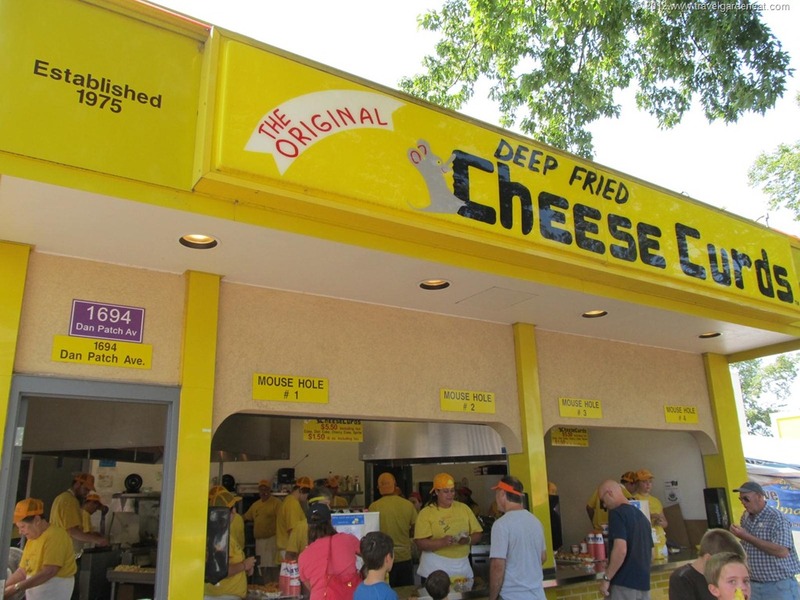 Mind you, not just any cheese curd will do — for me, it has to be the cheese curds from the “Original Deep Fried Cheese Curds” stand, located on Dan Patch Avenue. 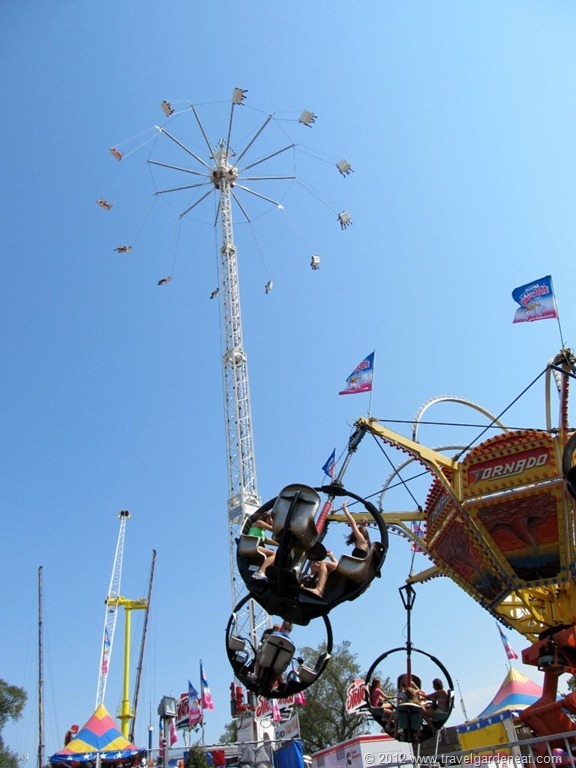 While the Midway is not the primary focus of our visit, we always pick a few rides to round out our Fair experience. Since I have one son who inherited his father’s “I hate spinny ride” genes, that leaves me as the ride companion of last resort for my other son. 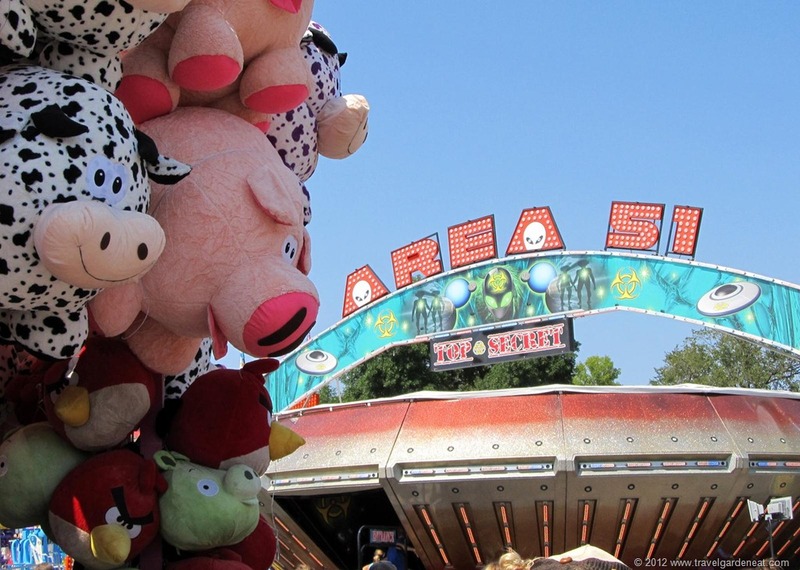 Amazingly, my stomach stayed strong after our first few rounds of Fair food, as we spun round and round, stuck to the wall of the “Area 51” ride, followed by Crazy Mouse and another roller coaster. We bypassed the swings this year, which in the past years have been at a humane height to enjoy the overhead views of the Fair as you spin somewhat reasonably high above it all. This year, the Stratosphere was the featured swing ride and I could not even make out features on riders’ faces with my naked eye as the ride lifted the double swings to a height that made my stomach churn from far below. Reading the week before how the swings had multiple occasions of stalling and leaving riders 100 feet in the air, I vetoed swings as an option this year. 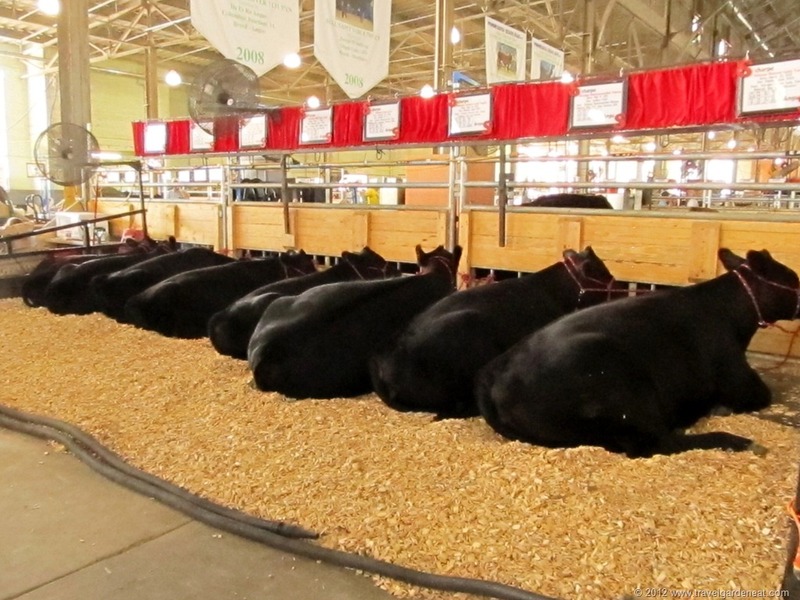 In addition to the food and the rides, we always look forward to walking the animal barns and gazing at the variety of cattle, horses and more. 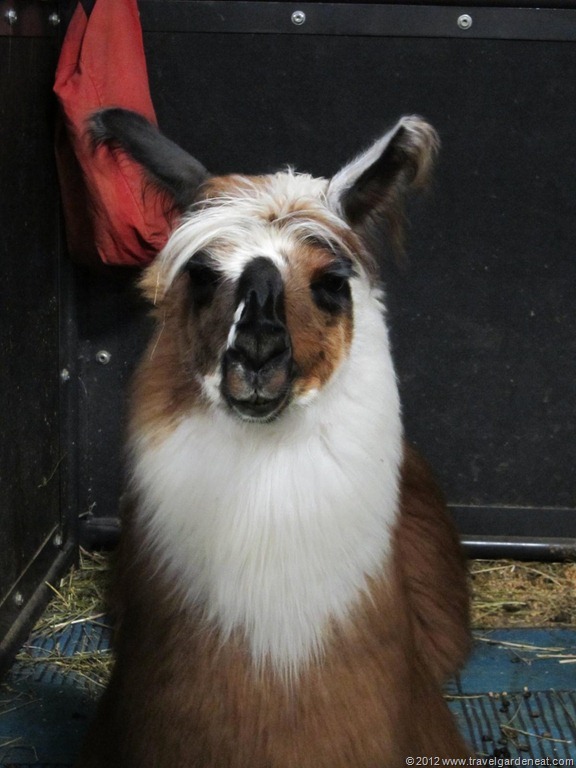 This year, we discovered llamas but missed getting to the poultry barn. In the Swine Barn, no petting the piglets this year due to the threat of swine flu. 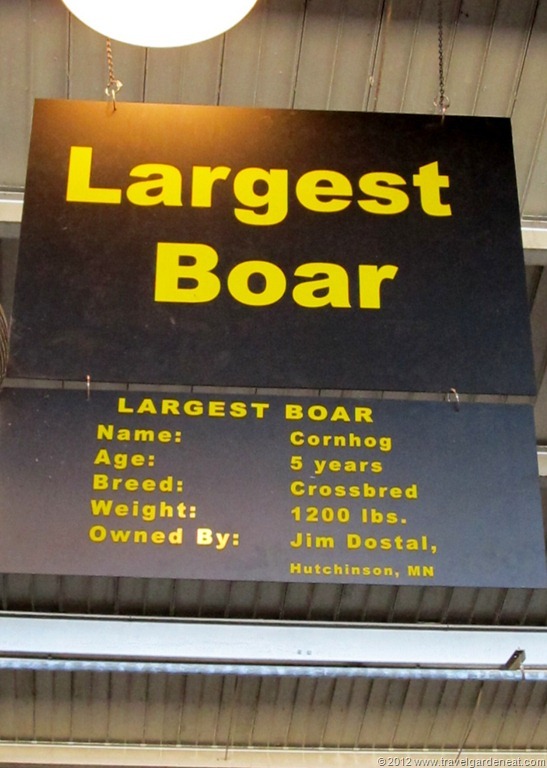 But, fair goers could still gaze at this year’s biggest boar, Cornhog — all 1200 pounds of him! 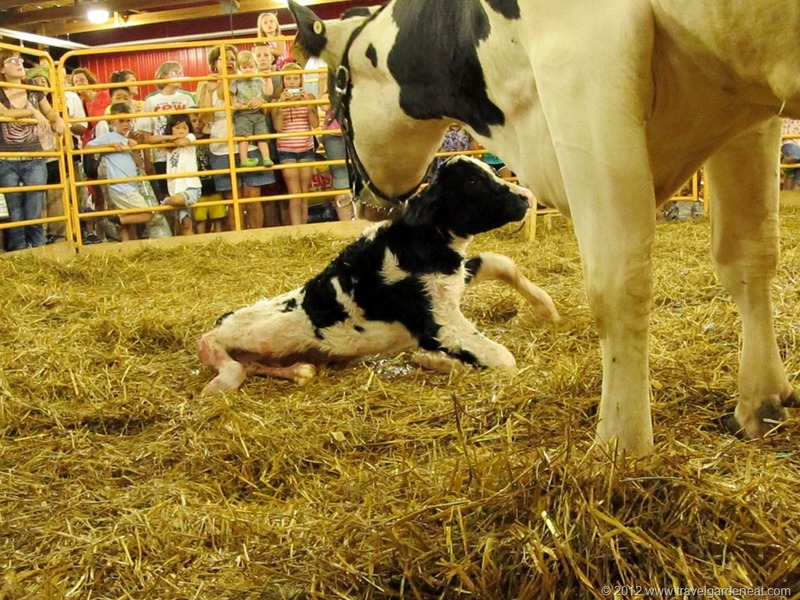 We also stopped by the Miracle of Birth Center, where calves, piglets, lambs and other farm animals enter the world during the Fair. 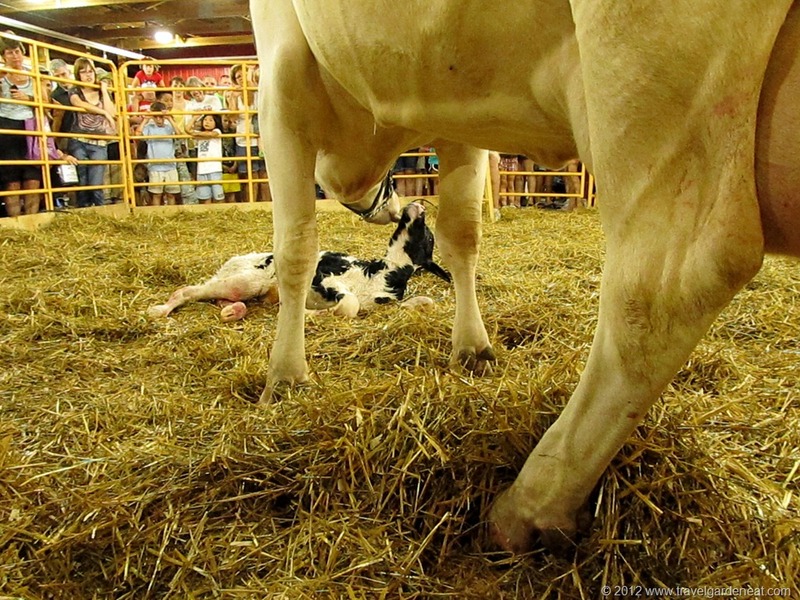 It is touching to see a calf just minutes old struggle to get to its feet as its mother continues cleaning it and encouraging it to stand. Maybe it is the mother in me that left me lingering on the scene . . . because when I turned to find my teens, they had long since disappeared to wait on a bench outside the building, ready for our next food stops. We continued to graze on our favorite Fair foods, along with a few new nibbles, throughout the day. 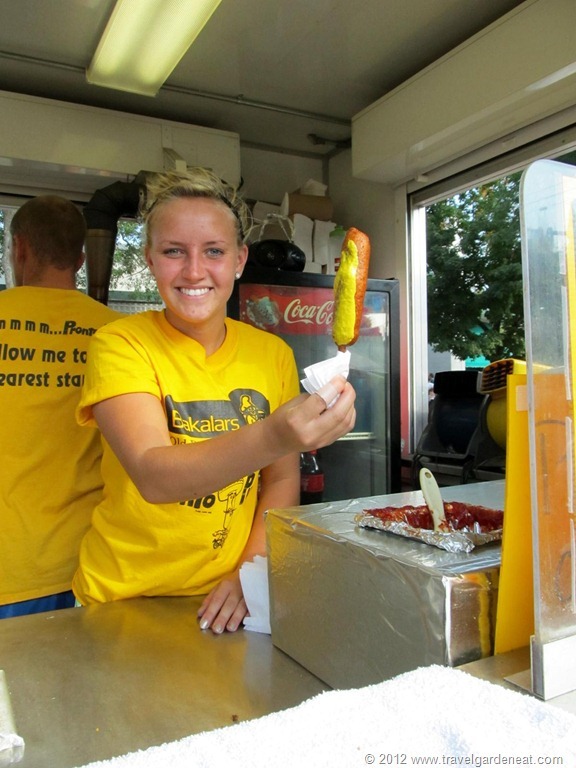 An original Pronto Pup and the Corn Roast — classics that never grow old! Falafel-on-a-stick was something we tried last year that required a return visit this year, along with Mediterranean lemonade (we decided it edged out the fresh-squeezed variety this year in terms of flavor). Among the new tastes for us this year, a camel slider (which we all agreed was relatively non-descript and not worth a return visit), Hawaiian-style Mexican torta from Manny’s Tortas (my son gave that a thumbs up and the enthusiastic torta crew encouraged a return trip next year! 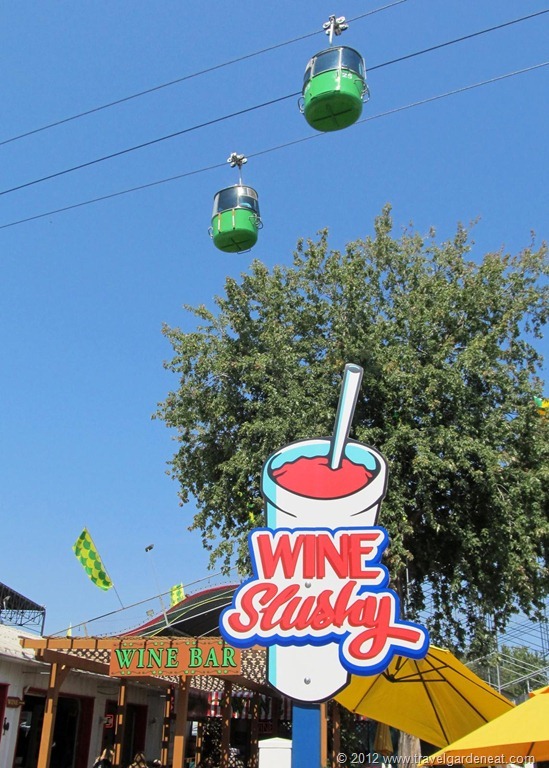 ), and my favorite new food, a wine slushy (incredibly refreshing toward the end of a hot day at the Fair)! After the animal barns, time to visit the Agriculture and Horticulture Buildings, walking past an eye-catching pond garden by the Minnesota Water Garden Society. 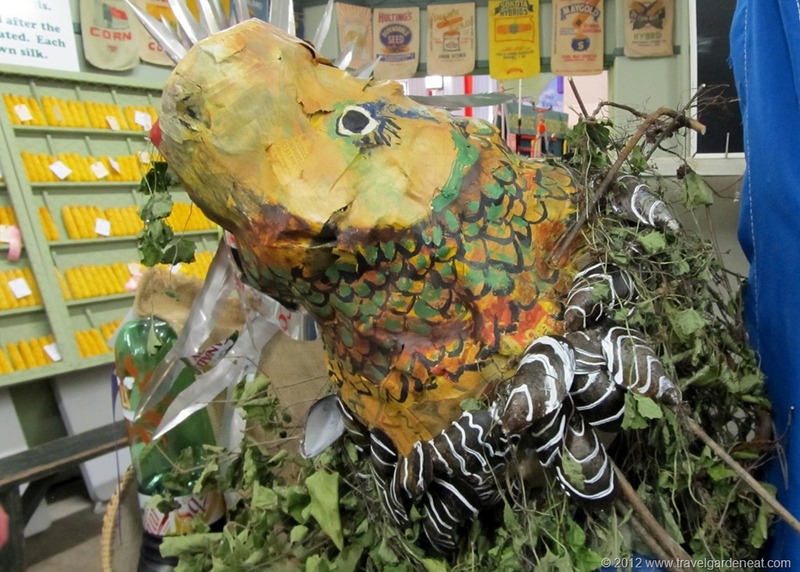 In the Ag-Hort Building, Crop Art is one of our favorite creative exhibits. 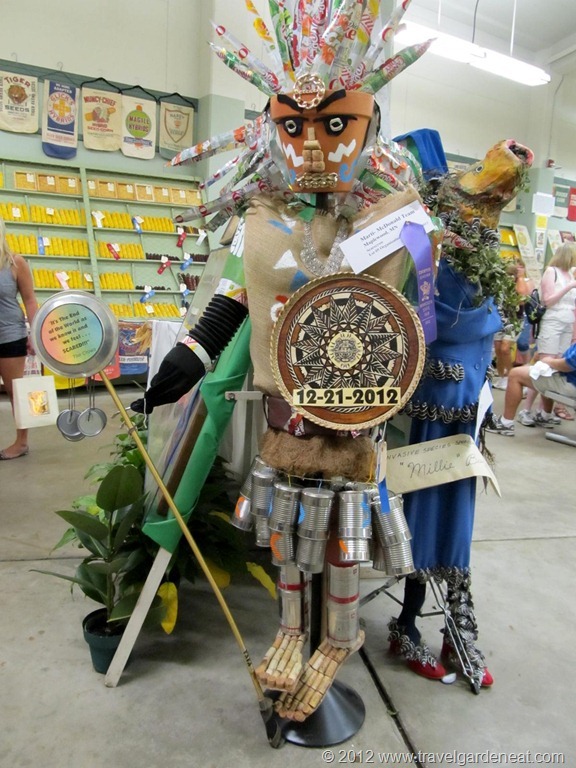 Categories include wearable crop art, although comfort did not appear to be a relevant factor in the design! The scarecrows were equally imaginative in their design and use of materials. Despite groans from the boys, I insisted on the annual visit to the Dairy Building to visit the butter heads. 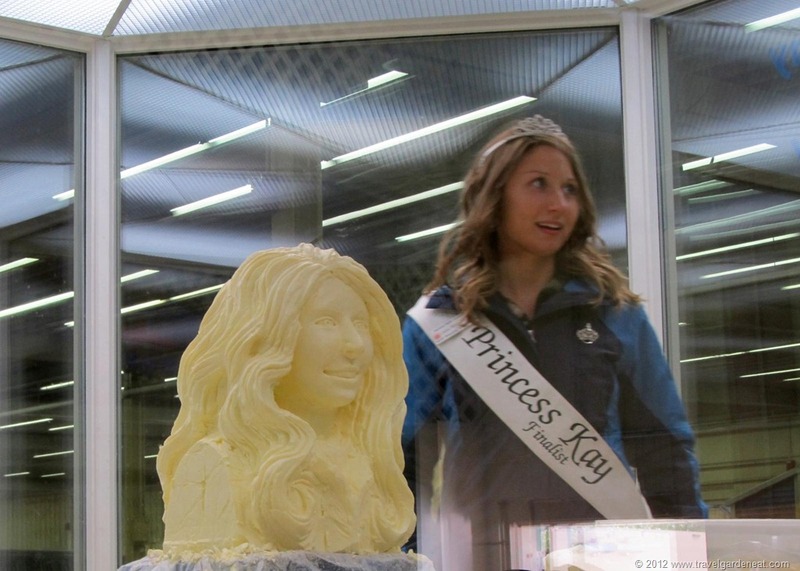 How often do you get to view 90-pound blocks of butter carved into the likenesses of Princess Kay of the Milky Way and the other dairy princesses! Crowds?! Yes. Hot, sticky weather?! Sometimes. 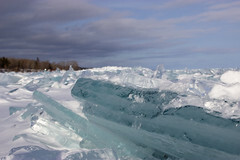 And, since it is Minnesota, cold, miserable weather?! Perhaps. 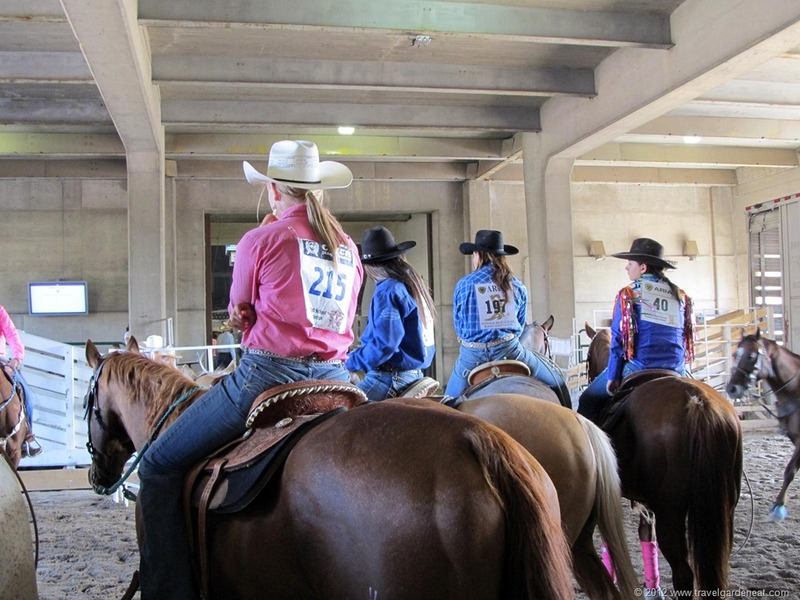 (The last year we went during that weather we ended up viewing more of the horse show than we ever had before inside the arena to stay warm!) But, is there any better event that combines the interests of travel, garden, eat?! I think not. Until next year . . . perhaps we will see you there? Those fried cheese curds look amazing. I’m in your camp. Awesome fair–such food! 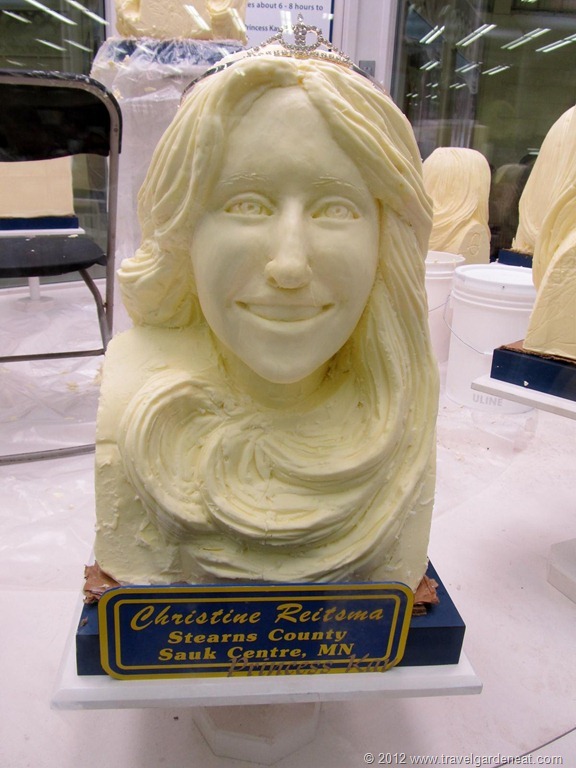 And I love the butter sculpting. But…were there some giant stuffed plush vegetables? You got me there! The only veggies which we closely encountered were the veggie fries! Greetings from Duluth. I’m a fair lover, you took some great photos. Thanks for subscribing to my blog. 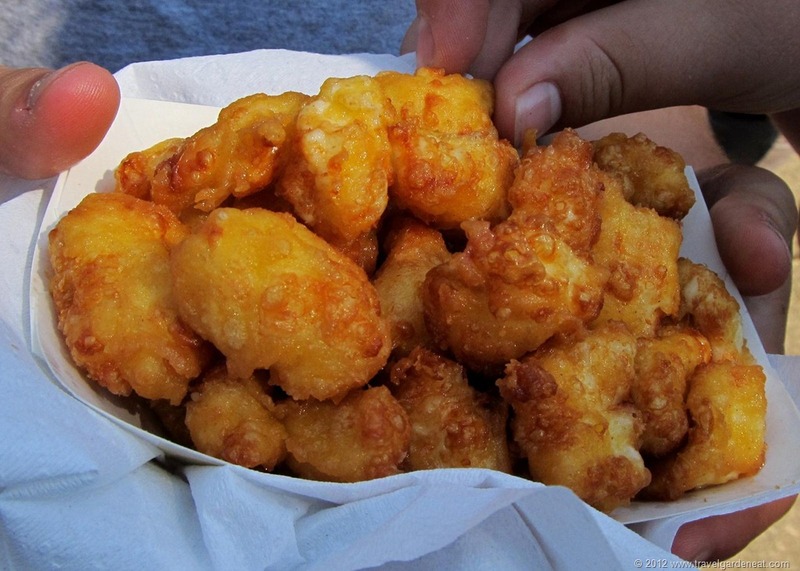 I never heard about Fried Cheese Curds but they look so tasty that I get hungry now! So unhealthy, but an annual Fair favorite! 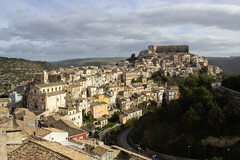 Pingback: Weekly Photo Challenge: Unique | Travel. Garden. Eat. 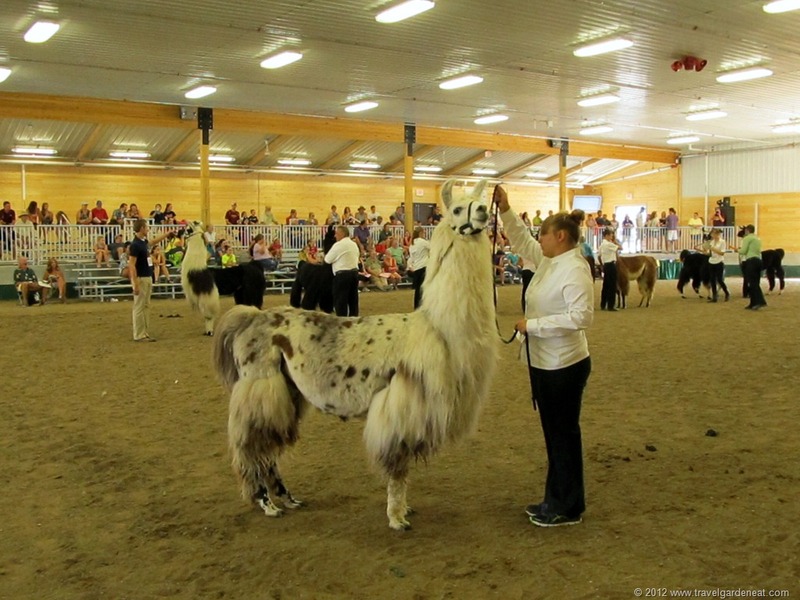 Pingback: Minnesota State Fair 201: An Advanced Fairgoers Guide | Travel. Garden. Eat. 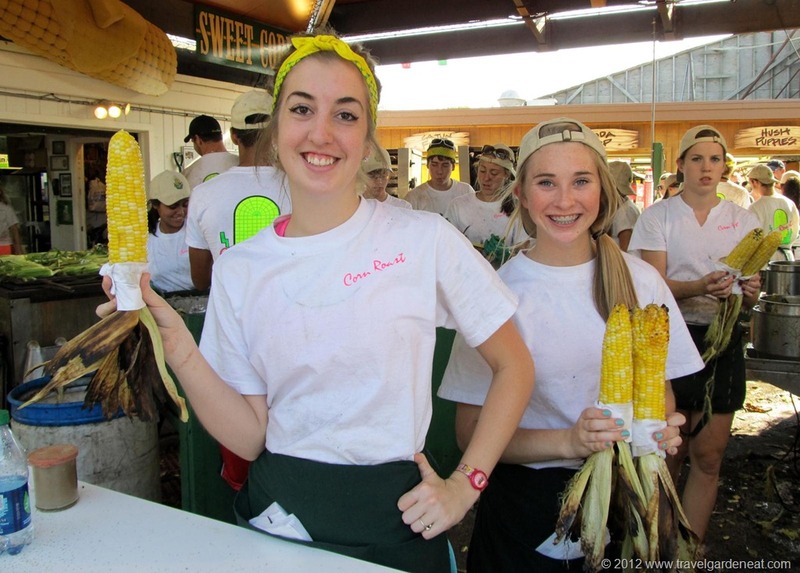 Pingback: Making the Most of the Minnesota State Fair – Travel. Garden. Eat.